Rev. Graylan Hagler and the DC Poor People's Campaign protest inhumane conditions at the DC Central holding block including roaches and vermin. 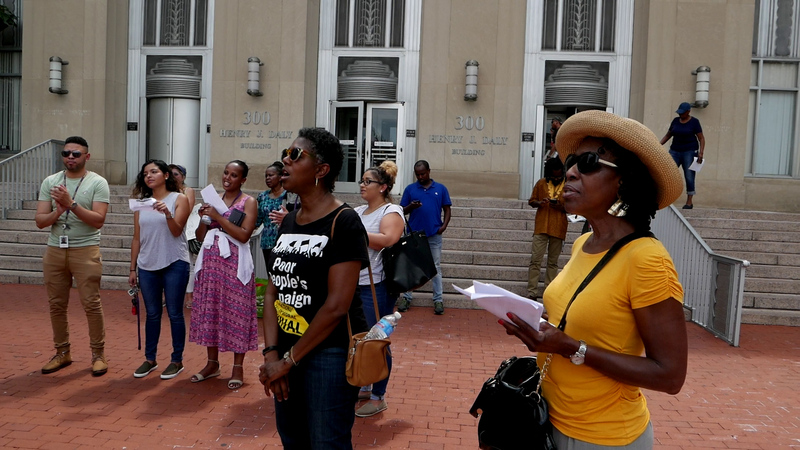 Protesters describe their experiences being held at the DC jail and call for it to either be renovated or closed. "Stop Corruption and Money Laundering," says UN and Corps. Permalink Submitted by HannahJubilee on Fri, 08/10/2018 - 18:49. The UN Economic Commission for Africa renewed calls to tackle money laundering during a UN meeting this week in Addis Ababa. At the meeting, governments were urged to follow the recommendations in the Mbeki report that notes Africa loses between $50 and $80 billion annually through corruption, tax evasion and other "illicit financial flows." “The revenue loss to countries from tax evasion and money laundering across Africa impact vulnerable communities across the continent," stated Eric LeCompte the Executive Director of the religious development group, Jubilee USA. "Too many African countries are facing new debt crises because of revenue shortfalls." LeCompte serves on United Nation finance expert groups. In an opinion piece in The Hill on Thursday, the vice president of the National Foreign Trade Council urged Congress to adopt transparency regulations to tackle money laundering and corruption in connection with Russia. The author cites recommendations from a report of the Atlantic Council that would reveal the actual owner of a shell company. "Anonymous" shell companies can be used as vehicles for corruption and to hide the identity of the owner who benefits from the corporation. Board members of the National Foreign Trade Council are a who's who of multinational businesses including Amazon, Chevron, Ford, Facebook, Deloitte and Walmart. "Congress is considering legislation that can help address global corruption and tax evasion," noted LeCompte. Legislation currently under consideration by the US Congress could help address the money laundering problem. Representatives Carolyn Maloney (D-NY) and Peter King (R-NY) introduced the Corporate Transparency Act (HB3089) in the House. Senators Ron Wyden (D-OR) and Marco Rubio (R-FL) introduced the companion Senate bill (S1717). The legislation would create a registry for the true owners of shell companies. Last week 24 US Attorneys General wrote Congress asking for legislation like the Corporate Transparency Act.